The Book of Unknown Americans is a fitting title for this poignant story of two families, young love, and the obstacles one might face trying to find a place in a new culture and society. Maribel Rivera and her parents arrive at the Redwood Apartments in Delaware with very little. They left behind a relatively prosperous life in Mexico after an accident leaves Maribel with a traumatic brain injury. Her parents want the best for her, hoping a special school in the United States will bring their old daughter back to them. Then there is Mayor Toro who wishes he was more like his brother the soccer star and college student. His family has been in the United States for fifteen years, having come over from Panama, fleeing their war torn country. Through Arturo and Alma Rivera, Maribel’s parents, the reader gets a real sense of what it was like for them: homesickness, being strangers to the country, not speaking the language, and adapting to their environment as best they can. Arturo was able to secure a work visa, but his job in the U.S. is a definite step down for what he had been doing in Mexico. The hours are long and the conditions are quite rough. Such a simple thing as finding a store and shopping is a challenge. The author conveys the loneliness and outsider-ness the Riveras feel so well. My heart broke from them. They left behind comfort and home for such a bland and cold place . . . There is one scene in which Alma gets lost, missing her stop while on the bus, and she struggles to make it back home, knowing her daughter is getting home from school and expecting her to greet her. My heart broke for Alma. Her desperation and fear. Unable to really communicate with those around her, not really knowing where she was. It was interesting too to examine the relationships between the characters. Child and parent. Husband and wife. Brothers and friends. There was a definite strain in Alma and Arturo’s relationship—from the accident that injured Maribel to the move to a new country. And also in Rafael and Celia Toro’s marriage. The relationship between Mayor and his father is a tense one, Rafael’s expectations of his son are a particular strain on their relationship, and Mayor feels like he must lie to his father instead of telling him the truth. Alma and Arturo very clearly love each other and their daughter, and will do just about anything for her. They aren’t quite sure what to make of the growing friendship between Maribel and the neighbor boy Mayor, but they are open to it as they begin to see improvement in their daughter’s condition. Mayor is taken by Maribel’s beauty from the very first, although put off by her initial—seemingly--disinterest. The more he gets to know her and the more he draws her out, and the closer they become. I came to really like Mayor and rooted for him and Maribel, even as their parents weren’t sure what to make of their growing closeness. The Riveras are very protective of their daughter, which is understandable. 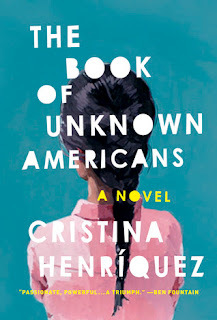 Although the novel is mostly told from Alma and Mayor’s viewpoint, giving the reader a glimpse into the Rivera and Toro families, Hernandez also offers brief looks into the lives of the other residents of the Redwood Apartments, all immigrants, all with their own stories of struggle, loss, and hope. There is the photographer, army veteran, a small business owner, and a line cook, to name a few. They come from various Latin American countries, including Mexico, Venezuela, Panama, Guatemala, and even Puerto Rico. I would not have minded more of a chance to get to know some of the more minor characters and see them interact with the main ones. I think they all have stories worth reading. Overall, I found The Book of Unknown Americans to be a thoughtful and emotion-filled read. Although it seems like a big of the story is meant focus on Mayor and Maribel’s story, I was most taken with the side stories and the struggles of the parents. Their stories felt more fleshed out and real to me. This is a novel of survival, family, love, hope—and yes, heartbreak. I am grateful to my Going Postal Mail Group for the opportunity to read it. You can learn more about Cristina Henríquez and her books on the author's website. She can also be found on Facebook and Twitter. Sounds like a very emotionally intense read! Thanks for the review, Wendy! I love immigrant stories and think they're particularly relevant these days. I think I have this book and will try to get to it soon. Like bermudaonion, I think immigrant stories are relevant and important. Sounds like this one should be on my list. I should read this one! I'm glad you wrote about your experience with this book. I'd heard about it, but it's been a while since I read a review of it. I'm going to keep it in mind for those times when I need a book that's outside my norm. Great review! I really want to read this one because stories of the immigrant experience definitely speak to me. I feel like if more people read these stories perhaps we could understand better how much people give up when they are in search for better circumstances rather than demonize them which seems like it happens all too often lately. Sorry, don't mean to go on a rant but I just wish people showed a bit more compassion. Thank you for sharing this book with us! I'm always drawn to immigrant stories because the journeys are just so poignant. I like that the side stories in this book are just as engaging, if not more so, than the primary storyline. I've had my eye on this book for a while and I think your wonderful review has just convinced me that I need to read it. This sounds like a really great story. It is so hard to imagine what it would feel like to suddenly be in a completely foreign environment. It sounds like this book would really illustrate some of those emotions. I read this as an ARC back in 2014. I remember liking it. I can only imagine what Maribel went through. It certainly like an emotional journey for them. Wonderful review. Like the others, I find immigrant stories are relevant especially in today's world. This book sounds like an emotional read and thanks so much for sharing your reading experience with us, Wendy. Thank you everyone for your thoughtful comments! I agree with many of you. I am drawn to immigrant stories, and think this is one definitely worth reading if you haven't already.